It seems the flood gates have opened for all things Iron Man 3. While Avengers is still making gang busters in DVD and Blu-Ray sales Marvel wants to get you focused on Phase 2 of their cinematic universe. 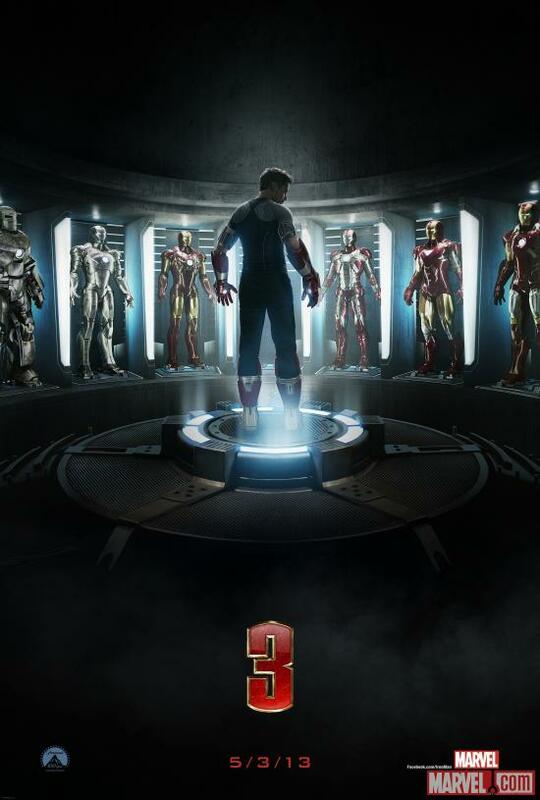 Iron Man 3 will be the first up to bat when it hits on May 3rd, 2013. Over the weekend a bunch of official shots have hit the web in anticipation for the first trailer hitting TOMORROW. We have collected what has been released so far. Hit the jump for the highlights, and then take a look at the full gallery. First up Marvel.com has released the first poster for the film showcasing the hall of suits and Tony wearing pieces of his next set of armor. The full set was shown off at Comic-Con this year and looks very interesting with a whole new color scheme. If you have not seen that yet don’t worry we have it in this article. Now that we have a poster, lets give you the official synopsis from Marvel Studios. Next up, let me show you what very well may be my favorite pic so far! It’s being said that Rhodey (Don Cheadle) will be wearing this armor as an upgrade to his War Machine suit. 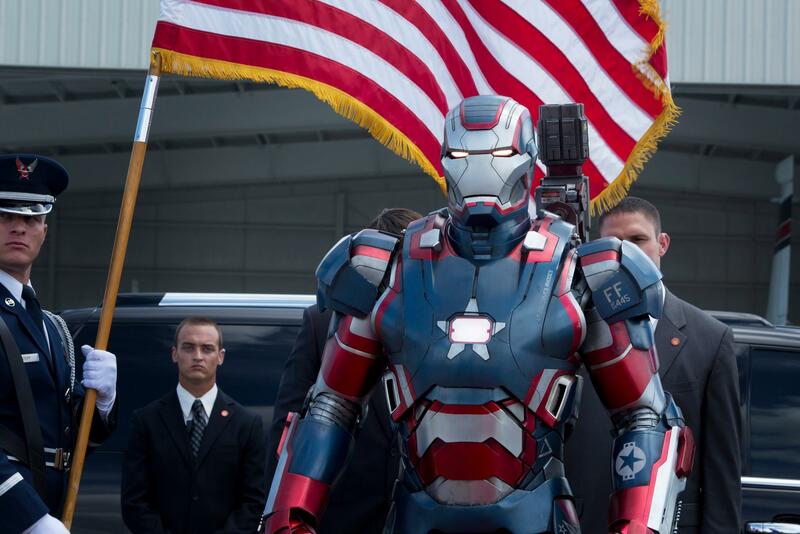 It’s also not confirmed with this will actually be called the Iron Patriot Armor or go under a different name. What happens to the suit beyond that is something you will have to wait till May to find out. The last big pic we want to highlight is just below! 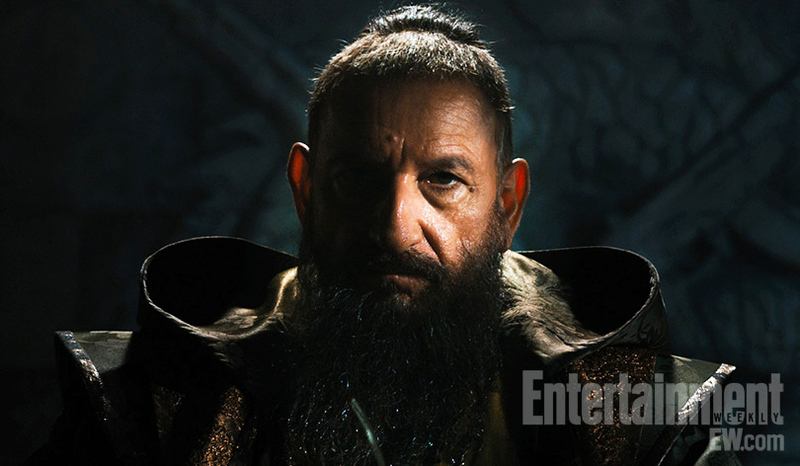 Our first official shot of the Mandarin is here! The character’s involvement in the 3rd film has been a mystery until recently. When Director Shane Black first came on board he made it clear that Mandarin was not going to be in the film. Obviously this was either smoke and mirrors or Marvel did what Marvel does and told Mr. Black “Oh hell no, we gotta have Mandarin”. The choice of actor couldn’t be better as Academy Award Winner Ben Kingsley steps in as Stark’s nemesis. Kingsley, despite his level of talent that would leave people to believe he would be picky in his roles, enjoys character work. The best example of this is his reasoning for signing onto the wretched Uwe Boll film “Bloodrayne” for nothing else other than he wanted to play a vampire. This could prove to be the strongest villain to come along in the Marvel Cinematic Universe since Loki. There are obviously more pics to see, so take a look at the gallery for these above shots and MORE!